Experience Charles Dickens’ great novel (arguably his greatest) in one energetic and sweeping evening of theatre. This compact adaptation cuts right to the narrative core of Pip’s unexpected journey from orphan to gentleman as aided and inhibited by three memorable Dickens characters: the escaped convict Magwitch, the beautiful Estella, and the lonely, embittered Miss Havisham. Six actors create an atmosperic Victorian world in this fast-paced classic coming-of-age adventure. Approximate running time: 2 hours. Read the program here. Robbie grew up in Western Massachusetts and graduated West Springfield High School. He attended the Syracuse University Drama Department for his BFA in Acting. While at Syracuse, Robbie studied abroad in London, England at Shakespeare's Globe Theatre. Robbie's last semester of undergrad was spent living in NYC taking part in the Tepper Semester for Careers in Theater. In 2012, Robbie was one of the youngest actors in the history of the program to be accepted into The Old Globe/ University of San Diego graduate theater program. In his first semester, Robbie was cast as Freddy in the 100th anniversary production of Pygmalion at The Old Globe opposite Tony Award winner Robert Sean Leonard. 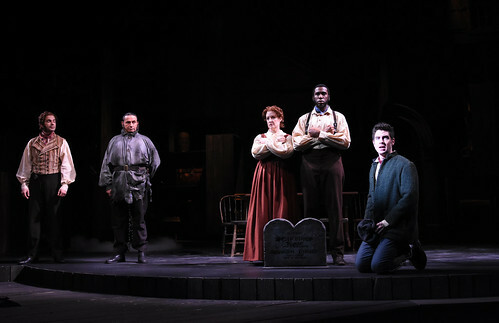 The production was directed by 2013 Tony Award nominee, the late, Nicholas Martin. Pygmalion went on to become the best selling play in the history of The Old Globe. Robbie graduated with his MFA in Acting in June 2014. Robbie currently resides in New York city after spending this past year working in the Berkshires of Western Massachusetts, Northern New Jersey, and back at The Old Globe in San Diego. This fall, Robbie shot the new Hulu/ NBC Universal show, THE PATH starring Aaron Paul, and Hugh Dancy. This winter Robbie has been traveling back a forth from China performing in sold out industrial arena concerts. He can also be seen studying with the Upright Citizens Brigade in Manhattan.